At some time or another, every helicopter needs repairs. Whether this is a result of a crash or just wear and tear, or even an upgrade, this page is for you. This movie details what to look for in a new charger and battery, what to look for when something wears out, how to determine a dead battery, a dieing or dead motor, and how to fix overheating. It also details how to fix range problems. Check out Volitation Mods and Upgrades to see a much better way to fix overheating on coaxials! And best of all, like almost all the mods I do . . . ITS FREE! Yup, I am the biggest cheapskate the world knows when it comes to spending. I'd much prefer to fix it myself then buy a repair part. The next two videos below explain how to replace motors / pinion gears (little gear on a motor) on coaxial helicopters. This is a breakdown of what I've found to be the most common repairs done on an RC Helicopter. Note, this does not currently address simple things such as replacing blades. First, one of your rotors is loose; if this is the case, you will generally be able to see a noticeable difference in speed between the two rotors. If you can't (or even if you can) you can test if this is the problem. Hold on to the bottom gear to keep it from spinning and apply a slight pressure to spin the top rotor, not so much that you break something, but enough to see if the screw holding the gear to the shaft is doing its job. Then do the same thing with the top gear and the bottom rotor. If either of these move when they shouldn't, you have a faulty connection; look at the gear associated with the rotor that moved when it shouldn't have, and find the little screw holding the gear onto the shaft. You may notice that the gear (typically the top one) has bent or broken so that the screw no longer holds it well. In this case, you can either attempt to glue the gear back together, which may or may not work, or get a new gear, which should work. Second, you burned a connection on your PCB; in this case, you'd see a black burn mark on one of the little wires (and the surrounding area, probably) inside the circuit board, leading to a plug where one of the motors connects. It should be fairly easy to spot. This is bad news; you have to buy a new PCB to fix this. 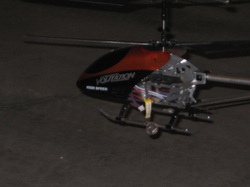 Replacing a motor (main or tail) is a common thing on smaller / cheaper / lower quality helicopters. Basically, if your helicopter does not use a brushless motor(s), then you will replace the motor(s) eventually (although even brushless motors don't last forever). This is actually pretty easy to do. All you need to do is unplug the motor from the PCB, ESC, or Receiver, whichever it is for your helicopter; typically, coaxials and FP helis have their motor plugged into the PCB, while CP Helis have it plugged into the ESC, and the Receiver via the ESC. For a CP Heli, go ahead and unplug the easier of the two. Then, unscrew any screws holding the motor in place. This should render the motor removable without any cutting of wires (unless you have a very basic low quality heli - see why you should invest in a hobby grade machine?). Simply pull it out, gently, and put in your new motor. The type of motor or part number of the motor that you should use to replace should be specified in the instructions or online; if you have a very low quality and / or non-hobby grade heli, sorry you are out of luck (which is the main reason to stick with a good brand of helicopter). I've found overheating a very common problem on RC Helicopters. Basically, there are three ways to fix this. One is to fly for shorter periods at a time, which is not preferable and not usually necessary. Another is to increase the size of heat sinks on your PCB / servos / etc, which doesn't work on all helicopters; click here to learn about how to do this on your 9053 Volitation Coaxial (scroll down a bit to get to Overheating). You can also cut ventilation holes in the canopy or remove the canopy to help, as well. Sooner or later, most non-aluminum swashplates will lose their ball link connectors. This will keep the linkage bars (the little bars that connect the blade grip to the swashplate) from connecting to the swashplate. What I have done to avoid buying an entirely new swashplate is to secure the linkage bars with a generous amount of model glue around the extruding part of the swashplate where the ball link used to connect to. Once the glue dries, this makes your swashplate almost as good as new. If you want, you can even put out a chunk of glue to hold the link connector in the correct location. This will probably only work on micro swashplates, however. For FP or CP Helis, a broken tail boom is a big issue. If your tail boom breaks on a shaft or belt driven CP Heli, I think the only fix is probably getting a new one. If however you have an electric tail motor for a micro or small heli, there is a cheap fix that works fine. All you have to do is bend the boom back into the correct location (assuming its carbon fiber, which it should be) and glue it with model glue. I also use paper clips broken to a shorter length to add further strength, and to keep the boom from bending very much in flight. Then, wrap the boom and holder tightly together with a lot of masking tape and glue the outside. The result is a boom with perhaps a slight bit more weight, but greater strength. You can also slightly lengthen the boom even outside its holder and secure it this way (which is what I did) and it works great. Occasionally, a main shaft may crack or break. A loose strand of hair may also be wound up in the main shaft. 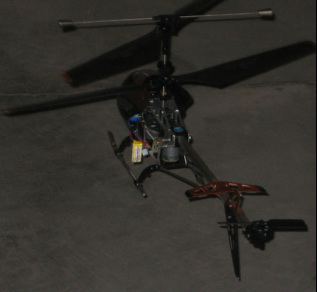 This causes the main rotor to slow down, and may even stop the rotor from spinning entirely, if serious enough. Do not fly with a cracked main shaft. If this happens, the best thing to do is remove the shaft from its holder and replace it (or just remove the hair, if that is all). Usually, this entails removing the main gear and any securing screws, so make sure you remove all that hold the shaft in place and place them in a secure location! These are the most important screws on your heli. Take care to avoid removing any extra grease, as this will make the shaft a bit less efficient in rotation. For a coaxial, in order to remove the outer shaft you must first take out the inner shaft. In the picture to the right, the main gears are in the bottom white box, and the inner shaft is denoted by the top white box. The inner shaft always connects to the lower gear, and the outer shaft to the higher gear. So to remove the inner shaft, be sure to remove the lower gear. If you must remove the outer shaft as well, you will likely have to remove some extra screws. For a general idea of how to remove the inner shaft, view the first bit of the lower blade swap video on Volitation Mods and Upgrades. For a CP / FP Heli and 4 channel coaxials (and some 3 channel ones), you will have to disconnect the swashplate from the servos. Simply pop off the pushrods (or rods with circular openings at the top) from the swashplate. Then remove the main gear and any necessary screws (which there may not be any). You will be able to tell when the shaft can come out because it will slide out of the frame with just a push. It should not require much effort, otherwise there is still something holding the shaft to the frame. Be very careful and watchful when doing this fix, and be sure to put the helicopter back together the way you took it apart. If you want, take a movie of this process and explain what you are doing as you do it, and then watch it to see how to put it back together. Many manufacturers have videos on their websites on how to do repairs such as this; if so, please view the video to understand how to fix your helicopter best.